It's that time again! Lamb of God Church in South Ft Myers has teamed with Thrivent Financial for Lutherans for their annual Thanksgiving Outreach, and we need your help. Our food banks are overwhelmed. Our system is broken. And it all caught us unaware. 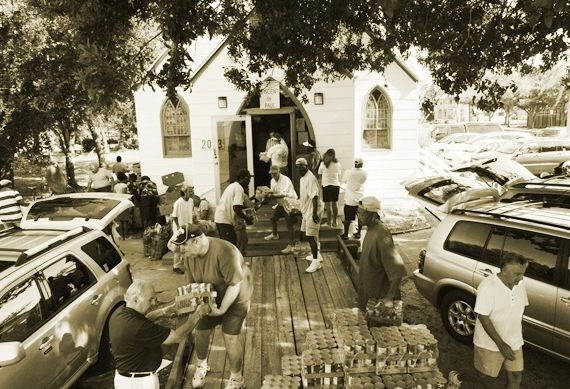 Hunger has reached natural disaster proportions in Lee County — and no one saw it coming. It's the perfect storm. A dramatic rise in unemployment, the collapse of the local real estate market and a weakened national economy combined to fuel an unprecedented rise in the number of people seeking the most basic of necessities - food - here in Lee County. The crisis, likened to a natural disaster, shines a bright light on the need to seek solutions - quickly. This year, with the help of over 400 volunteers, Lamb of God Church prepared over 5,800 meals for families in need all over Southwest Florida. Thank you to everyone who helped make this a possibility; we could not have done it without you. As always, we are looking forward to next year when we will once again have the opportunity to share Jesus with those in our area. For the 2008 Turkey Drive, over 200 volunteers joined together at Lamb of God Church to cook, package, and deliver Thanksgiving Dinner to over 3,000 families in need all over Lee, Immokalee, Collier, Charlotte, and Hendry counties. This year, we hope to be able to reach many more families, but we need YOUR help!